You can lend your friends a console disc. You can not lend them a game you buy on Steam. Or at least, you haven't been able to previously. That might soon be about to change. 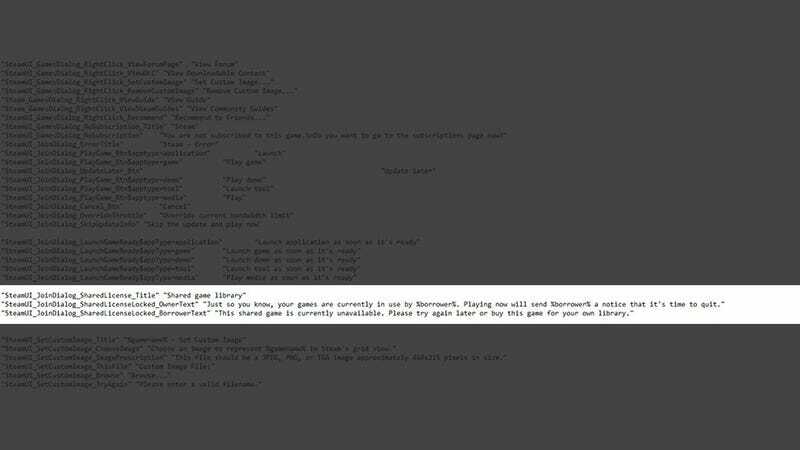 For three lines of code, that seems to present a pretty clear plan: you can let other Steam users "borrow" your games, then take them back whenever it suits. As it stands, right now once you buy a Steam game that's it. It's yours, tied to your account, and you can't trade it in, sell it or lend it like you could a physical console game. Letting PC gamers share their games, then, would be amazing, though how Valve is selling this to publishers I have no idea. Maybe every single full game can now be its own demo as well? Maybe Microsoft's ten-person "family sharing" plan for the Xbox One, which sounds a lot like this, is helping soften the blow for this kind of stuff? Or maybe it'll just be an option for publishers that almost nobody chooses to make use of. Or something the company is looking at/thinking about, but may never actually implement. Sorry to end this on a downer, but hey, that's business for you. We've contacted Valve for comment, and will update if we hear back.